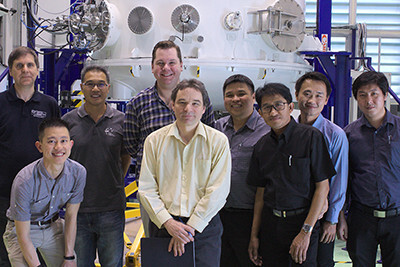 LJMU staff with collaborators from NARIT and the Thai-German Institute. Earlier this month, a deputation of Liverpool Telescope (LT) staff visited the National Astromical Research Institute of Thailand (NARIT) in the city of Chiang Mai. The purpose of the visit was to begin a programme of collaborative software development, funded by STFC through the Newton Fund. The purpose of the Newton Fund is to use science and innovation partnerships to promote economic development and social welfare in partner countries. The collaborative programme between the LT and NARIT is based around two projects: the development of a new, modern data archiving framework and a new telescope control system. At the end of the three-year programme, these products will replace the existing systems on LT and NARIT facilities, and will also be a component in the new software which will be required for the Large Robotic Telescope (Liverpool Telescope 2).